Product #18703 | SKU 1165180 | 0.0 (no ratings yet) Thanks for your rating! 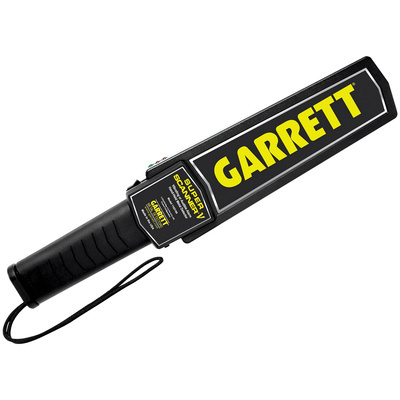 Trust the original, patented design of Garrett's SuperScanner V, which is the most recognized hand-held metal detector in the world. The industry leader for more than 25 years, the SuperScanner is backed by ongoing state-of-the-art Garrett engineering. Ultimate sensitivity: detects medium sized pistol from 9" distance; large knife from 6"; razor blades and box cutters from 3" distance; foil-wrapped drugs and tiny jewelry from 1". Rugged, high-impact ABS case with reinforced coil compartment. Exceeds Mil-Std-810F (drop test) Method 516.5, procedures II and IV. Large 8" scan surface: for quick, thorough scanning. No tools required to change battery (included). Sharp audible alarm and bright red LED indicates the detection of metal. Momentary push button helps temporarily eliminate detection of nearby ambient metal such as rebar, metal walls.